How to enter a different address for an existing client or email address. Sometimes you may have multiple client jobs/proposals that need to be associated with the same email address or client name, but different physical addresses. If you select that same client when creating the proposal (see below), if you change the physical address, it will be changed on all proposals for that client. 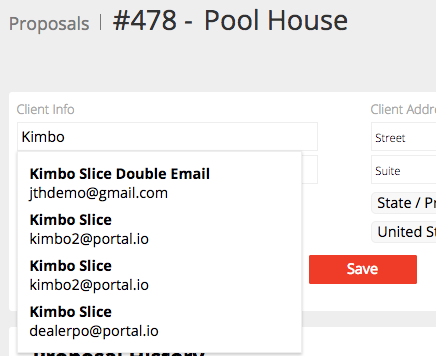 In order to use the same email address or client name with a different project address, make sure you do NOT select the client from the drop down list when you are entering their name or email on the proposal. Selecting the client from the list links the client information fields (for all proposals using that client). If you have a current proposal that you've already linked to an existing client but you want a unique address, just remove all fields starting with the last (zip/city) until there are no fields in client info on the proposal. THEN, enter the information one field at a time without selecting from the drop down and hit save.